Garage door springs lift all the weight of the garage door to make it easy to open and close. For example, if a garage door weighs 200 pounds, a spring force of 200 pounds is need to lift the weight of the door. This can be accomplished with springs that either stretch or torque special parts to assist in balancing the door. Replacing garage door springs is dangerous because of the torque in a wound torsion spring or the stretch in an extended extension spring. Garage door repairs often involve replacing parts that are tied into the spring system, and many accidents, injuries and deaths have occurred for those who do not understand the forces at work. A proper understanding of garage door springs, garage door weights, garage door parts, and how these are interconnected is essential for safe repairs. We are expert at garage door spring repair. 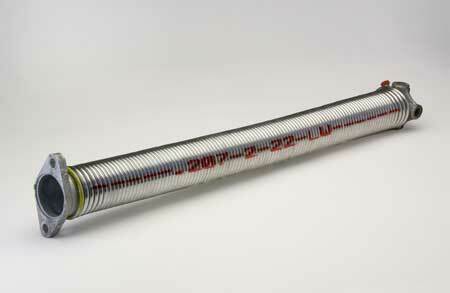 Garage door torsion springs are secured to a metal shaft above the garage door. Depending on the system, the shaft may pass through the middle of the springs or spring, or the shaft may sometimes house the spring. If the shaft passes through the middle of the torsion spring, the spring may be mounted in the middle of the shaft or on the end of the shaft by the outside edge of the garage door. 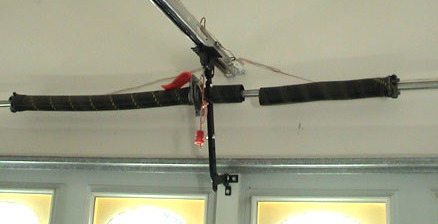 Torsion springs balance the garage door by applying torque to the shaft with drums at each end. Attached to each drum is a cable that extends to and is secured to the bottom fixture at the bottom of the door. The torsion spring unwinds and winds as the door is opened and closed to comprise a balanced system. Torsion springs have three characteristics that determine the lift and cycle life. These properties are the wire size, inside diameter and length. The lift, which is determined by the torque of the spring, tells how much door weight the spring can lift. The cycle life tells how many times the garage door should open and close before the spring breaks.